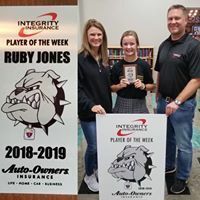 Eighth-grader Ruby Jones shared Player of the Week honors last week with the aforementioned golfers. She's on the Junior Girls Cross Country Team and recently finished 3rd in the 1.55 mile run at the Quitman Ranch Run. She also plays basketball.